The Hall C Compton Polarimeter uses a novel detector system built of thin slivers of diamond, seen here. The lab-grown slices of diamond, measuring roughly three-quarters of an inch square (2 cm) and a mere two hundredths of an inch thick, are outfitted like computer chips, with 96 tiny electrodes stuck to them. The electrodes send a signal when the diamond detector counts an electron. Diamonds are one of the most coveted gemstones. But while some may want the perfect diamond for its sparkle, physicists covet the right diamonds to perfect their experiments. The gem is a key component in a novel system that enables precision measurements that could lead to the discovery of new physics in the sub-atomic realm — the domain of the particles and forces that build the nucleus of the atom. But to ensure that electrons with the correct characteristics have been dialed up for the job, nuclear physicists need to be able to measure the electrons before they’re sent careening into nuclei. That’s where a device called the Hall C Compton Polarimeter comes in. It measures the spins of the groups of electrons that CEBAF is about to use for experiments. “It’s about measuring the property of beam polarization: What fraction of the electrons’ spins in the beam are aligned,” says Mark Dalton, a Jefferson Lab staff scientist and a member of the team who designed, built and operated the polarimeter. The beam polarization is a key quantity in many experiments. Usually, an experimenter will purposely flip the spin of the electrons in the beam between two orientations: with the electrons spinning along the direction they are traveling and with the electrons spinning opposite the direction they are traveling. This allows the physicists to compare the results they get between these two conditions, but only as long as they know the polarization in both conditions to high accuracy. The Hall C Compton Polarimeter provides that accuracy. It works by first shining laser light onto the speeding electrons. To see that difference, the physicists shine a laser beam through a transparent vacuum window and onto the beam of electrons. “To shine the laser light into the beam pipe, you have to go through a vacuum window, and the stress on the vacuum window causes the window to distort, which distorts your laser beam,” Dalton explained. These distortions in the laser beam have, in the past, led to the dominant uncertainties in the extracted beam polarizations. The physicists needed to figure out a way around this distortion. They found the answer was as simple as looking in the mirror. “Basically, as you shine the light, some small fraction is reflected and comes back toward the laser. If you separate out the part that comes back and you analyze its properties, you can learn what the properties are when the laser light strikes the electrons,” Dalton said. The Hall C Compton Polarimeter measures the polarization of the CEBAF electron beam just before it reaches the experiment. The electrons collide with laser light - some of the electrons are knocked of their nominal path and are separated from the main beam by a dipole. The dipole acts on the electrons in a manner similar to the way a prism acts on light, separating out the slower-moving electrons that came from collisions with the laser. These slower electrons are then counted in a detector, which allows the determination of the polarization. With that problem solved, the nuclear physicists then needed to be able to count the electrons that are knocked out of the beam by the laser light. By comparing how many are knocked out when the electrons are spinning along the direction of travel and compare it to the number of electrons knocked out of the beam when they are spinning opposite to the direction of travel, the physicists can get their final measurement of polarization. For that, they needed a strong material that could stand up to being constantly bombarded by the particles. 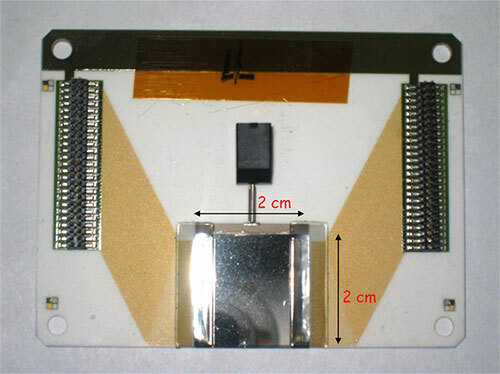 According to Dipangkar Dutta, a physics professor at Mississippi State University and a Hall C Compton Polarimeter team member, other experiments have used silicon for this component, called a detector. But silicon can’t stand up to the constant particle bombardment that some experiments generate. “To capture most of the knocked out electrons, your detector has to be very, very close to the main beam, so that’s why it gets exposed to a lot of radiation. And beam radiation tolerance is a very important property,” Dutta said. That’s when they determined that diamond can also be a physicist’s best friend. The novel system uses thin slivers of diamond in place of silicon. Specially lab-grown plates of diamond, measuring roughly three-quarters of an inch square and a mere two hundredths of an inch thick, were outfitted like computer chips, with electrodes stuck to them. This novel detector was put to the test in its first set of experiments in 2010-2012. According to David Gaskell, a Jefferson Lab staff scientist and the Hall C Compton Polarimeter team leader, the device provided the most direct and accurate measurement of electron beam polarization at high current of CEBAF’s electron beam to date, with uncertainties of just 0.6 percent. The team published an analysis of the polarimeter’s performance in the January-March 2016 issue of Physical Review X. This is the first paper published on Jefferson Lab research in this highly selective, online-only, fully open access journal that was launched in May 2011. The goal of the precision measurements that this new device helps make possible is to discover new physics in the subatomic realm — the domain of the particles and forces that build the nucleus of the atom, such as protons and neutrons, and their quarks and gluons. The polarimeter was designed, built, and commissioned in a multi-institutional collaboration for the Q-weak experiment with technical contributions from Jefferson Lab, MIT-Bates, and TRIUMF, as well as funding contributions from the U.S. Department of Energy, the U.S. National Science Foundation and the Natural Sciences and Engineering Research Council of Canada. The polarimeter was initially deployed for the Q-weak experiment in Jefferson Lab’s Hall C. The Q-weak experiment aimed to measure the weak force, a force that acts on subatomic particles and is one of nature’s four fundamental forces, along with electromagnetism, gravity and the strong force. Subatomic particles carry a weak charge, a measure of the influence that the weak force can exert on them. Q-weak measured the weak charge of the proton, a quantity that is predicted very precisely by the Standard Model of particle physics, but has never before been measured. Physicists have released preliminary results for the experiment, and they are now working on the final result. But the team said that the Hall C Compton Polarimeter performed so well, that it may be one of many technologies that make possible a whole new breed of experiments for exploring for new particles and forces that go beyond the Standard Model description of the sub-atomic realm. “If we couldn’t make this work, access to physics beyond the Standard Model is going to be a lot harder, a lot more uncertain. So this is a key technical development that will allow Jefferson Lab to really access this new area of physics,” Gaskell said. That’s good news for the three graduate students who also made significant contributions to the Hall C Compton Polarimeter while pursuing their Ph.D. in nuclear physics. Amrendra Narayan, Mississppi State University, worked on the diamond detectors and analysis; Don Jones, The University of Virginia, worked on the laser system; and Juan Carlos Cornejo, The College of William and Mary, worked on the photon detector. The team isn’t resting on its laurels, however. Now the physicists are focused on improving the polarimeter’s accuracy even more, so that its diamonds will be ready to sparkle for the next precision experiment.